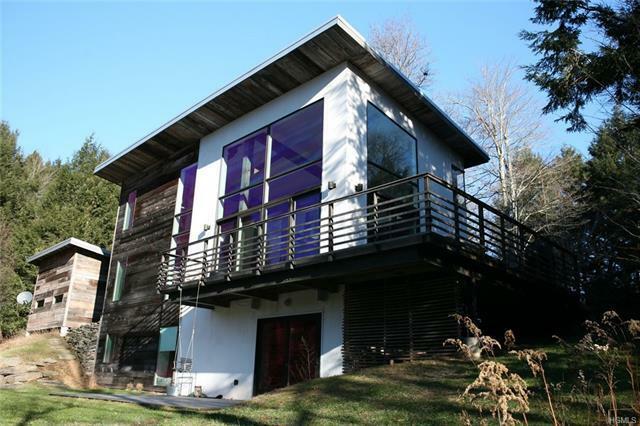 This stunning contemporary in Kenoza Lake Estates offers streamfront access to Hust Pond AND deeded rights to Kenoza Lake. Post-and-beam construction from recycled barn beams, soy-based SIP panels, and insulated glass provides an energy-efficient envelope, while state-of-the-art systems such as polished concrete floors, radiant heat, on-demand hot water and mini-split AC/heat pump units make for comfortable living. Each of the three finished floors has bedroom and bath facilities, and amenities include high-tech appliances and fixtures. Soaring spaces and glass walls offer lots of light and views of the sprawling lawn to the waterfront. Multiple decks make outdoor living easy -- enjoy sunset cocktails overlooking the water, or stroll to the streamside dock for a quiet paddle or refreshing swim. The one-car detached garage has plenty of storage or workshop space. Private setting in a gated community, close to western Sullivan County hamlets, 10 minutes by back roads to Bethel Woods!